The Ethereum Virtual Machine has three locations where it can store data; stack, memory, storage. Each of these storage locations play a major role in the execution model of the EVM and also helps to maintain the state of the blockchain. Before we talk about each of them, let’s take a detour and talk about Ethereum Accounts. Ethereum Accounts are objects with components such as storage state, intrinsic balance, number of transaction (nonce), 20-byte address, EVM code/smart contracts, maintained as part of the Ethereum state. Every account has a 20-byte address associated with it. An address is a 160-bit (20-byte or 40 characters) code used for identifying an account (e.g. 0x7053437291d7ef549f066f6802542106b59c0aee). An address is generated whenever a new Ethereum account is created. There are two types of Ethereum accounts, and they share the same address space on the machine. External Accounts: Accounts that are controlled by external entities, by an individual for example, using public-private key pairs. These accounts have no EVM code (smart contracts) associated with them, hence they have empty storage state and do not make use of memory. These accounts can be created using Ethereum Clients like Geth or Ganache. Contract Accounts: Accounts that are associated with EVM code and are controlled by EVM code. These accounts have non-empty Storage state and also make use of memory and stack during the execution of the EVM code stored as part of the account. A contract account is created when a smart contract is deployed on the Ethereum blockchain. It is derived from the creator’s address and the number of transactions sent from that address, also called “nonce”. The foregoing explanation highlights the fact that storage and memory on the EVM is always connected to an account. Let’s go ahead and discuss each of the storage locations. 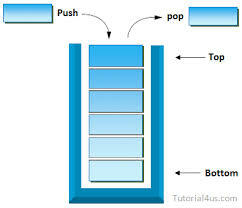 As discussed in the first article of this series, the EVM is a simple stack-based architecture. All the computations on the EVM are performed on the stack. The operands for instructions are taken from the stack, and the result of intermediate operations are also stored on the stack. A stack is a data type which serves as a collection of elements, with two principal operations: push which adds an element to the top of the stack, and pop which removes the topmost element from the stack. The PUSH, DUP and SWAP operations have several versions which are used where applicable during the execution of instructions. The PUSH operation places an item on the stack. It has 32 versions (PUSH1 to PUSH32), where PUSH1 instructs 1 byte to be placed on the stack and PUSH32 instructs 32bytes (full word) to be placed on the stack. The DUP operation duplicates an item on the stack and pushes the duplicate to the top of the stack. It has 16 versions (DUP1 to DUP16), where DUP1 duplicates the first item, DUP2 duplicates the second and so on until DUP16 which duplicates the sixteenth item on the stack. The SWAP operation swaps items on the stack. Like the DUP operation, it also has 16 versions (SWAP1 to SWAP 16), where SWAP1 swaps the first and second item on the stack, SWAP2 swaps the second and third item on the stack, and so on until SWAP16. The EVM stack operates in a much complex way, but this gives us a fair idea of what the EVM could be doing. The second storage location is the Memory. 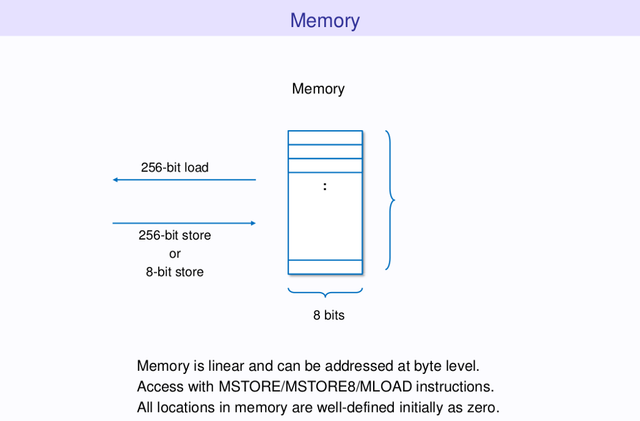 The memory is a storage area that is created when functions calls are made to smart contracts. It is used to store temporary data such as function arguments, local variables and return values. Like the RAM (Random Access Memory) on x86-64 machines, the memory is volatile — its data is lost when power is switched off. The sample contract below shows how memory may be used on the evm when function calls are made. The third data location is the Storage. Storage on the EVM is a persistent key-value store that maps keys to values, the keys an values are 256-bits word. A smart contract can only read or write to its own storage, it has no access to the storage of external contracts. 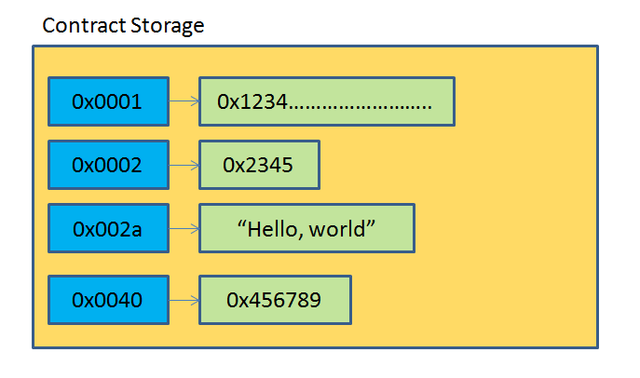 All storage locations are initially defined as zero. The cost of each of these operations is highlighted in the diagram below. In Solidity, storage memory is represented as state variables declared outside of user-defined functions, within the context of the contract. Let’s have an example code to understand how this works. The sample contract below stores the ages of certain persons in the contract storage when the contract is instantiated. First, let’s compile the contract and create a new contract instance using Truffle. Truffle is a framework for building dApps (Distributed Applications). It provides functionalities such as compiling, debugging, and testing smart contracts out of the box. The contract instance is stored as an object in the storeAge variable. 4b is the hexadecimal representation of 75. This confirms how fixed sized state variables are represented in storage. Let’s confirm how mappings are mapped in storage. The mapping state variable is meant to be stored in index 2 on storage. Let’s set n as index 2, padded to 32 bytes i.e 64 characters, each character being 4 bits. Let’s set p as the key of the first item in the mapping with key 1, padded to 32 bytes. Next, we find the hash of the slot of the first item in the mapping. With this address, we can obtain the value of the first item in the mapping from storage. 37 is the hexadecimal representation 55. This also confirms how mapping are mapped in storage. In this article, we expounded the details data management on the EVM. The EVM uses the stack to perform computations, memory is used to store data from function calls and the storage persists data on the Blockchain.